Ah yes, the Hurricane. 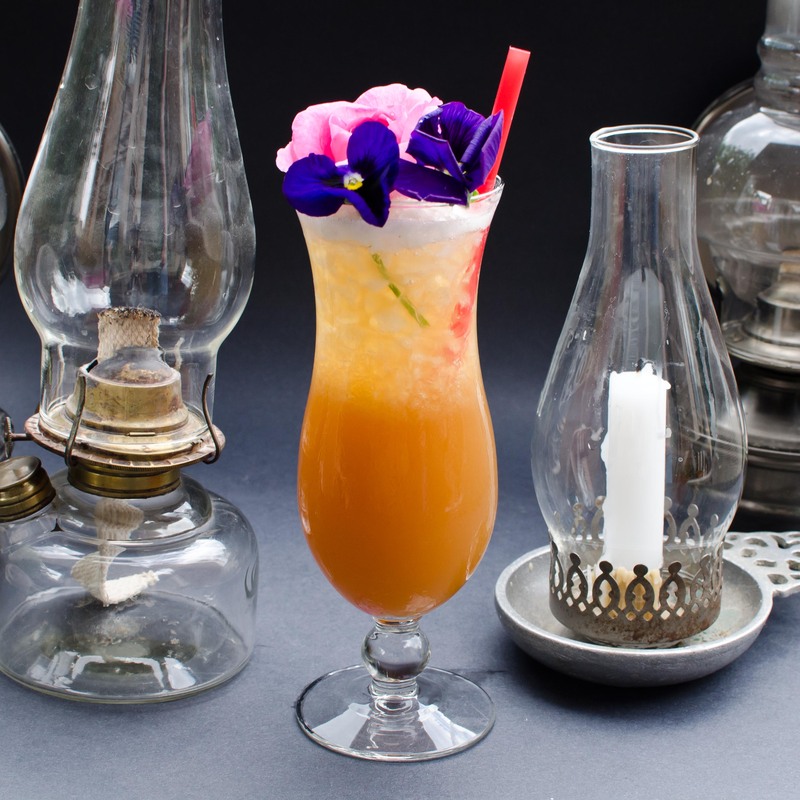 Like many faux-tropical drinks, it has a messy history, though it’s not quite as convoluted or controversial as those of the Mai Tai and the Zombie. For one thing, we know the time and location of its origin — Pat O’Brien’s Bar in the French Quarter, circa late 1940s (though I have found mention of another source, the Hurricane Bar in New York, 1939). Like its Tiki cousins, however, the Hurricane has fallen victim to the use of artificial mixers and a profusion of ingredients that were entirely absent in the original concoction. Shake well with lots of crushed ice, enough to fill 2/3 of the shaker tin. Pour unstrained into a large hurricane glass or chimney glass, adding more ice to fill. Serve with a straw. The tall drink, served in glasses shaped like hurricane lamps, became wildly popular in the Big Easy…so popular that Pat O’Brien’s formulated an bright red artificial mixer to take the place of the original fresh ingredients, lower the price, and keep up with demand. If you visit the bar today (visit the patio garden, say Berry and Taggart), you can order the famous Hurricane, but it will be nothing like the original recipe (especially the color!). Regarding the rum, dark Jamaican is best, as you need something heavy with a bit of sweetness and caramel flavor. I made the above drink with a blend of Spiced Appleton Extra and Myers’s and it came out very nice. Matt Robold likes Coruba in his; the Bum likes ’em with Goslings, reportedly. If you’d like, swap the lemon juice for lime — or, even better, split it between the two. I’ve noticed that a lemon-lime blend improves many drinks (e.g. the Margarita and numerous fizzes) that call for one or the other, and the Hurricane is no exception to that rule. Using just the lemon, is comes out fairly tart, and there’s nothing to push back against the flavor of the passion fruit syrup. Indeed, between issues of availability, artificiality, and taste, the syrup is the problematic ingredient in this drink. Having been on my own personal quest for passion fruit syrup/pulp/juice, I can see how this particular fruit fell by the wayside since the Hurricane’s inception — in addition to rum, there must have been passion fruit galore in New Orleans in the 1940s, as nowadays it’s a bit tough to find. I’ve finally found a steady source of Monin Passion Fruit Syrup, which is decent but contains a bit too much citric acid zing. The best and most convenient are quite possibly B.G. Reynolds’s, from Oregon, or Auntie Lilikoi’s, from Hawaii. If you go this route, be prepared to shell out cash for shipping charges! Also be prepared to mix a ton of Tiki drinks — the best syrups should be used within a month of being opened. If you’re making it –It’s easiest to use 100 % passion fruit pulp mixed with and equal amount of 1:1 simple syrup, as per Beachbum Berry’s instructions. The Bum does not recommend using passion fruit juices or nectars like Ceres and Looza for syrups, as they’re already cut with sugar, water, and other flavors. – Frozen packets of passion fruit pulp by La Fé, Palmas, or Goya, thawed and combined with an equal amount of 1:1 simple syrup. – Funkin passion fruit purée, ordered online and combined with an equal amount of simple syrup. – Buy tons of passion fruit and juice them yourself — inadvisable given their cost, lack of availability (at least here in Georgia), and small yield — and combine it with sugar. Good luck with that. 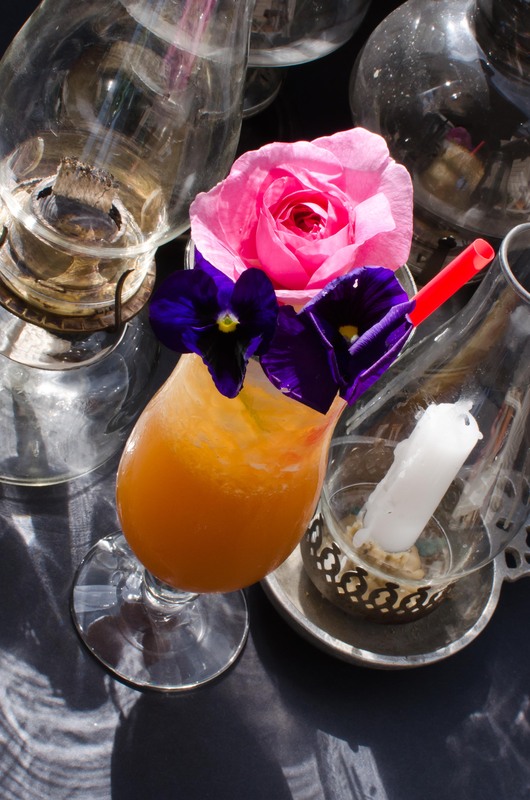 Anyway, should you not want to go through all that trouble, I do have a likable, alternative recipe for a Hurricane that uses passion fruit juice rather than syrup (Berry recommends Ceres). Shake with ice and strain into an ice-filled hurricane glass. Garnish with a maraschino cherry and an orange wheel. Chuck Taggart’s newest recipe uses 2 ounces of passion fruit syrup in lieu of the passion fruit juice and simple syrup, and his grenadine is limited to one teaspoon. Adjust the syrup and grenadine to taste, though you probably won’t need much. The drink should remain somewhat tart and refreshing, and not overly sweet. I should have seen this coming. The Hurricane became our house cocktail of choice as warm weather returned to the Minnesota; swept up in its deliciousness, I was just about to blog it myself, but here you’ve done a fine job—and my article went in the bit bucket. Thanks for the extra section on passion fruit syrup. I hadn’t thought of searching for fruit puree, great idea. Thanks Doug! The credit for the puree really goes to Jeff Berry. I wish you luck in finding the passion fruit pulp…I personally haven’t had much luck, so I’ve been buying the syrups. Don’t be so hasty tossing articles in the bit bucket — a second opinion on cocktails is always good have! I gladly default to the The Bum’s version of that bit of history. His scholarship is undoubtedly better than mine, which falls into the category of “stuff I heard around town.” 🙂 I’d probably better rewrite that article, too! Hiya, Chuck! I think we all know that any history tied in with bars and cocktails is hazy by default. All we can do is fit through the mess and come up with an approximate version of the ultimately-unknowable Truth. Love the new website layout, by the way. Still labyrinthine, as encyclopediae are bound to be, but there are few labyrinths out there that are so delicious and intriguing. Bravo! Just mixed up a batch of your “alternative” version. Found Cere passion fruit juice. You really did a good job. I will try the “original” afterwards, but I can not imagine it being much better that your recipe. This entry was posted on April 16, 2012 by IJ Lauer in Drink Recipe, Ingredient Recipe, Lemon Juice, Lime Juice, Orange Juice, Passion Fruit, Recipe Comparison, Rum and tagged cocktail, drink, hurricane, lemon, lime, original, passion fruit syrup, recipe, rum.